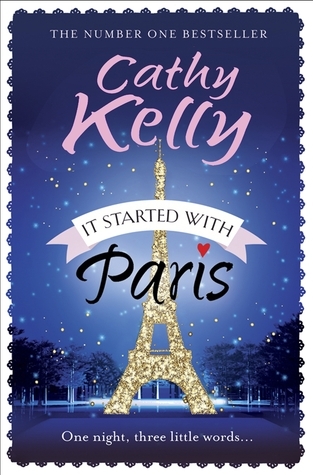 For anyone who hasn’t read a Cathy Kelly book before, know this: she is one of the premiere women’s fiction authors in Ireland and It Started with Paris is an excellent example of why. A sprawling cast of characters that all end up interconnected at different points in the story – because everyone does flipping know each other on that flipping island says the girl who lived there for five years – the book is charming slice-of-life narrative that begins with an engagement and concludes with a wedding. Kelly’s Ireland is authentic – weddings do happen during the week, the divorce laws are archaic, traditions are sacrosanct and cups of tea fix all ills. This is not a stylized Ireland, full of American ideas and dancing leprechauns. Instead, it’s a nation and an island of people who love deeply and celebrate enthusiastically, who take very little seriously except traditions and where family is the bedrock of all things, however one defines that idea. I’ve read most of Kelly’s works at this point. During my first period of living in Northern Ireland, I asked a woman in my village for a list of her favorite authors who wrote about life on the island. “Easy”, she replied, “Maeve, Cathy and James” – as though they were her best friends. So I set about reading Maeve Binchy, Cathy Kelly and gave James Joyce a hard pass because I had quite enough of him in English Comp classes, thanks so much. To me, Kelly’s book are immersive. You can live in this world for these couple of hundred pages and leave feeling a bit refreshed from your own troubles but also sad to be leaving some friends. As this story takes place in the southeastern tip of Ireland, I consulted a few of my favorites who also hail from that place for beverage recommendations. So for a cup of hot tea, you will need to go with Barry’s. For a cider, you’re going to need a Bulmers. For a beer, they’d say Franciscan Well. And as for a whiskey, there’s only Middleton. I received a copy of this book from NetGalley in exchange for a fair review. A version of this review also appears at Rakes of Romance.